Habit: Perennial herb, terrestrial [growing on other pls], non-green (nutrition from association of roots with fungi) or green, generally from rhizomes or tubers with few to many fleshy to slender roots; cauline leaves +- reduced to sheathing stem bracts or not. Leaf: 1--many, basal to cauline, linear to +- round, alternate to opposite (if only 1 pair), generally sessile. Inflorescence: flowers 1--many, spike or raceme, bracted. Flower: bisexual, bilateral, in bud generally rotating 180° by twisting ovary (position of parts indicated after twisting); sepals generally 3, generally free, generally petal-like, uppermost generally erect, lateral with chin- or spur-like projection (mentum) or not; petals 3, 1 (lip) different, spurred or not; stamens generally 1 (3 in Cypripedium, 2 functional, 1 a staminode), fused with style, stigma into column, pollen generally lumped, generally removed as unit by insect; ovary inferior, 1-chambered, placentas 3, parietal, stigma 3 lobed, generally under column tip. Fruit: capsule. Seed: many, minute. Genera In Family: +- 800 genera, +- 25000 species: especially tropics (worldwide except Antarctica). Many cultivated for ornamental, especially Cattleya, Cymbidium, Epidendrum, Oncidium, Paphiopedilum; Vanilla planifolia Andrews fruits used to flavor food. Note: Platanthera may be paraphyletic without inclusion of Piperia (Bateman et al. 2009 Ann Bot 104:431--445); study needed. Scientific Editor: Ronald A. Coleman, Thomas J. Rosatti. Leaf: at flower 0 or +- basal. Inflorescence: spike, generally dense, flowers in spiral; bracts leaf-like, < to > flowers, gradually reduced upward, linear to oblong. Flower: sepals, lateral petals narrow-lanceolate; upper sepal +- fused to lateral petals, together hood-like, enclosing column, lower +- free, +- = lip, adherent to hood; lip not spurred, pouch-like, deeply grooved below middle, concave above; column < lip, tip with anther on back. Fruit: spreading to ascending. Species In Genus: +- 40 species: especially America, also Japan, Australia, New Zealand. Etymology: (Greek: coiled flowers) Note: Plants in SN may be hybrids between species below, for which Spiranthes stellata P.M. Brown et al. might be correct. Unabridged Note: Plants in SN may be hybrids between species below, for which Spiranthes stellata P.M. Brown, Dueck, & K.M. Cameron might be correct. Habit: Plant 7--30 cm. Leaf: basal 3--13 cm. Inflorescence: 2--14 cm; flower bracts 6--14 mm. Flower: sepals, petals 8--12 mm; column 1.5--4 mm. Chromosomes: 2n=44,66,88. 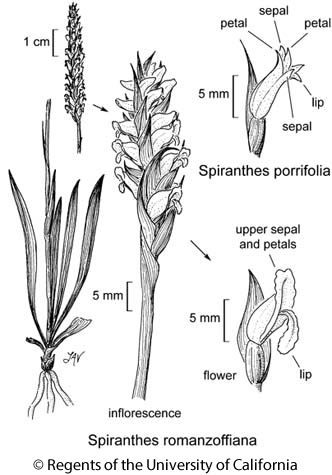 Citation for this treatment: Ronald A. Coleman, Dieter H. Wilken & William F. Jennings 2012, Spiranthes romanzoffiana, in Jepson Flora Project (eds.) Jepson eFlora, http://ucjeps.berkeley.edu/eflora/eflora_display.php?tid=45264, accessed on April 24, 2019. NW, CaR, SN, CCo, SnFrB, SnBr, SnJt, MP; Markers link to CCH specimen records. Yellow markers indicate records that may provide evidence for eFlora range revision or may have georeferencing or identification issues. Purple markers indicate specimens collected from a garden, greenhouse, or other non-wild location.